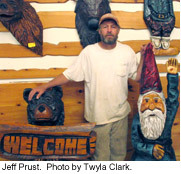 Jeff Prust is a self-taught chainsaw sculptor whose great skill lies in pulling out the personality of the wood. His works range from small to very large; you can see a good sample at his shop, Hawk Hollow. In his program, Jeff demonstrates the basics of chainsaw carving and speaks about the techniques he has learned.